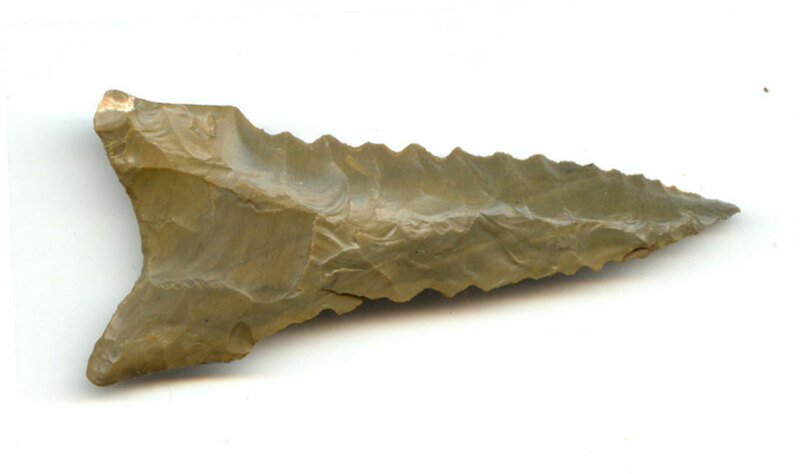 A Colorful, Anciently Heavily Use Sharpened, Visibly Aged, Nicely Serrated, Very Well Made Dalton Point That Exhibits Surface Sheen Aging And Stone Coloration Patination, Deep Aged Stained Hinge Deposits, Consistent Aged Surface Deposits, Correct Basal Thinning, Correct Rolled Basal Stem Edge Hafting Dulling, Correct Early Style Blade Flaking, Correct Material And Manufacture For The Area Found. Ex-Kevin Farmer, Dr. Kent Westbrook And Donny Austin Collections. This Is An Excellent Example, With Very Nice, Beveled Serrated Blade Cutting Edges, In Very Good Condition. Includes Dwain Rogers And Ken Partain Certificates Of Authenticity.